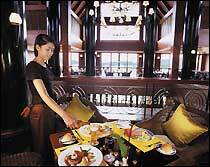 Enter into a cool, open-air lobby adorned with traditional Thai sandstone sculptures and black marble floors. 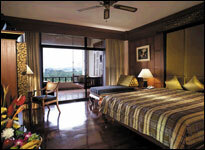 A doting staff will tend to your every need while you sit back and bask in the lap of luxury. 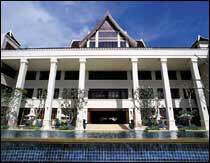 - Room rates are nett in Baht per room per night, inclusive of service charge, government tax and Breakfast. - Children under 12 years old sharing same room with parents, one extra bed is free of charge on room only basis, up to a maximum of 1 child per 1 room. - One compulsory dinner is required for guests who occupied during Peak Season. Blessed with all the comforts of home, accommodation at Pavilion Queen's Bay features 96 guest rooms with king size beds, and 12 appointed suites with spacious living rooms. All rooms and suites are equipped with satellite TV, IDD telephone, mini bar, in room safe, separate bathtub and shower stall and private balcony with a stunning seascape vista. 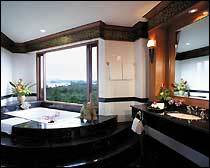 Experience luxury and enjoy convenience while remaining in total harmony with nature. The Oasis style architecture features a three-tier swimming pool with waterfalls and a Jacuzzi that looks out over the abundant foliage of Noppharat Thara Beach National Park. The Spa Clinique will relax and soothe your mind, body scrubs and body wraps are all available for your pleasure from a team of qualified therapists. The resort has a full range of restaurants beginning with an international buffet and a spectacular view at the Pavilion Coffee Shop. 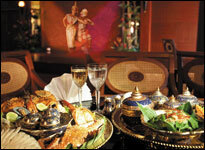 The elegant Dining Room serves up Thai and seafood sets while you are entertained by classical Thai shows. For a hearty breakfast overlooking the sea or a romantic dinner under the stars, you will find both at The Roof Top Terrace. The Teppanyaki Japanese Restaurant cooks up traditional Teppanyaki cuisine for lunch and dinner in authentic surroundings. Stop by the Full Circle Pub for cocktails, snacks, light music and exciting giant screen visuals. 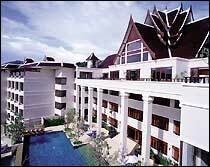 Also, our Meeting Facilities can handle seminars, conferences and banquets of up to 200 persons.